Only 1 blade, no conditioning strips and no pointless battery with comedy buzz effect. I'd like to see more stuff like this. 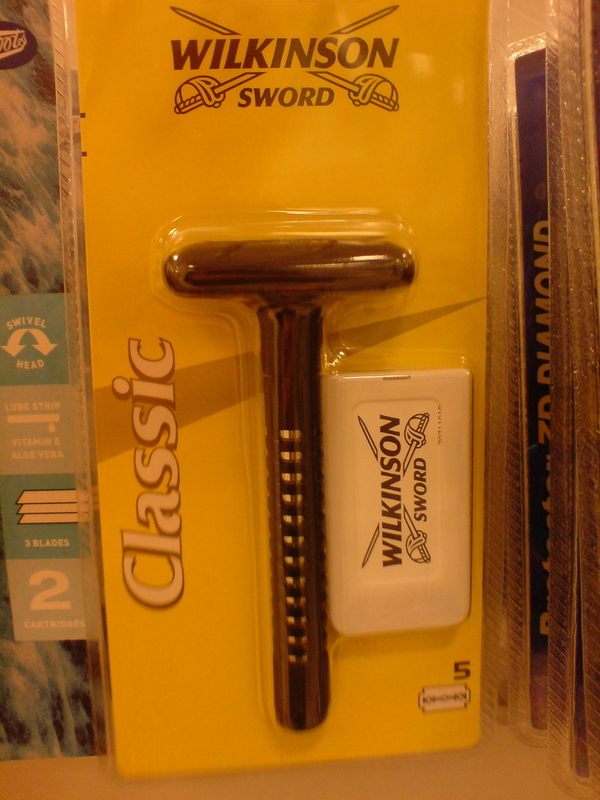 And I'd like to do some ads for this too (if you're reading Mr Wilkinson) there's a load of mileage in taking the piss out of standard razor ads. Product page here. 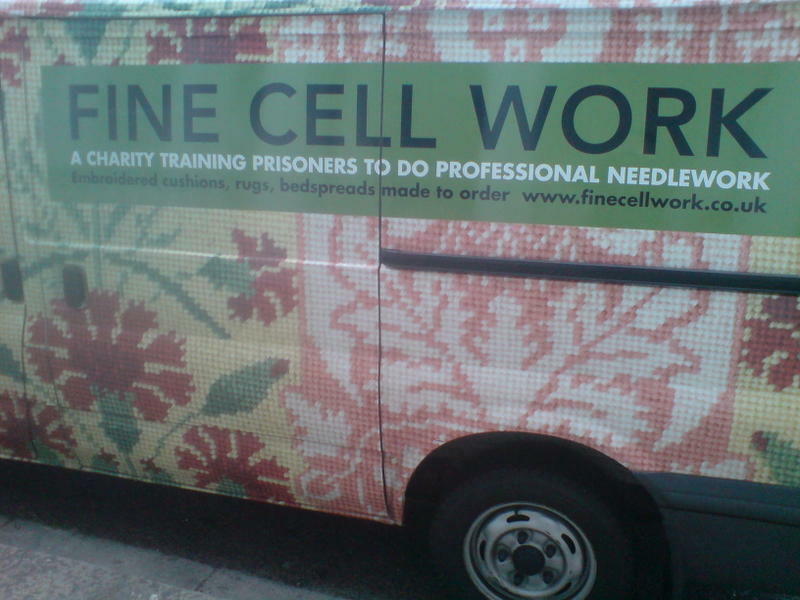 Every morning I walk past this van on the way to the tube. I like it because you don't see many embroidered vans these days (although I reckon the Mini Clubman would look awesome with a rug-based paint job). They do their own designs, and commissions too. 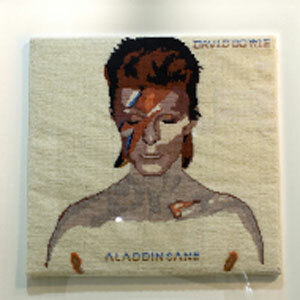 Like these excellent album cover 'covers' for Virgin Radio. FIFA Street 3 - short film. Nice, isn't it? There's not a really fresh creative idea here. "Computer game goes real world" feels like it has been done before. But the concept is particularly relevant for such an outlandish game and its executed very nicely indeed, so should drop the jaws of the kids its aimed at. I also think the absence of a 'message' at the end is great. It doesn't feel like an ad, with BUY BUY BUY at the end, or a wanky strapline like "Feel the street" or something. Its more like a nice bit of branded content, made simply to entertain - which I like. Very Nike. The website has a cool style too. Although its a bit lost on me because I haven't played the FIFA Street series, so I can't really comment. (Pro Evo all the way for me.) Still, its worth a look to see how the designers coped with having to do a caricature of Peter Crouch. How do you exaggerate his height?! Actual relationship marketing, Howies style. I like Howies. Not just for their clever use of blogs and stuff, I like the clothes too. 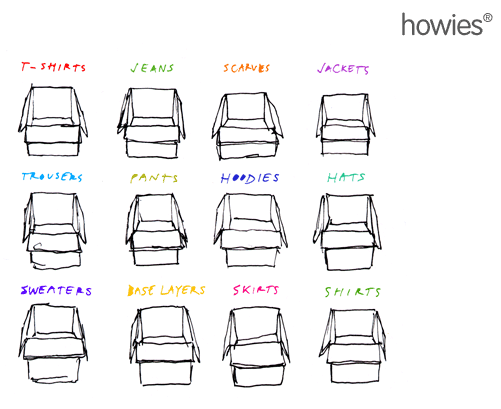 In fact, if I'm not careful, I'll soon have a Howies-only wardrobe (coat, hat, scarf, gloves, jumper, sweatshirt, boxers x 2, t-shirts x loads... and counting). Anyway they had a sale on, and sent me an email with some nice little drawings of empty boxes (that being their goal and all) - which I thought looked a bit like David Shrigley's style. Even though it was an automated email I replied anyway, partially out of stupidity, and partially to see if they'd get back to me. 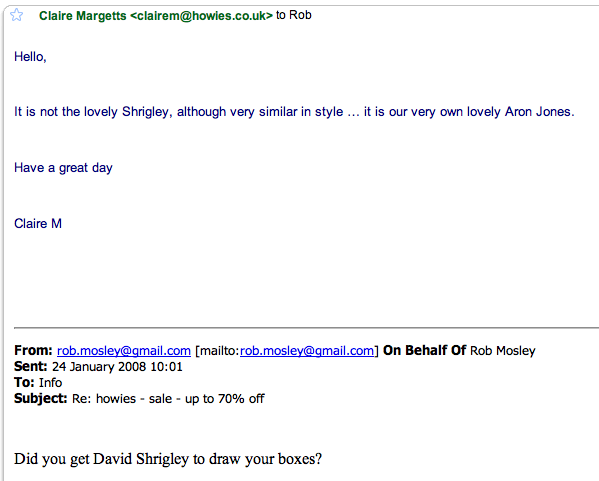 I'm delighted to say that Claire Margetts wrote back, informing me that the boxes were drawn by Aron Jones of Howies. So, now I like them even more. This kind of stuff is neglected by big brands - normally the set-up of their business is prohibitive I suppose. But I still think the big brands could try harder, allowing their good customer services people some authority - i.e. to deal with complaints without having to go through "procedure", or answering pointless emails occasionally. Can this really be that difficult?